Shipwreck Cove Cultist clue is a part of the hunt for the Order of the Storm branch of the clue. It’s a part of the second episode of the Legacy of the First Blade, Shadow Heritage. The question is where to find the Shipwreck Cove clue location, because it’s not exactly easy to find. It is in Shipwreck Cove, but that can be a tricky area to search through. 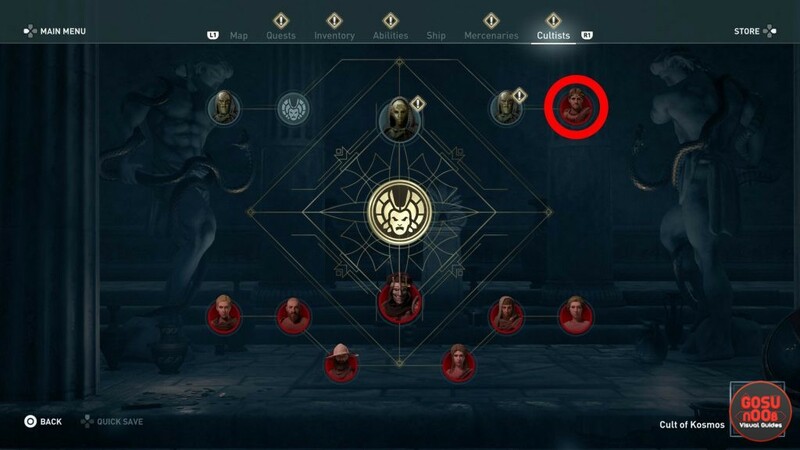 So, here’s our AC Odyssey Legacy of First Blade Shipwreck Cove Cultist Clue Location guide to show you exactly where to find the clue, and also where to find the cultist himself, Sophos the Broker. To find the Cultist clue in Shipwreck Cove, you’ll have to swim among the, well, shipwrecks. Shipwreck Cove is in the north of Scavenger’s Coast in Achaia. Once you get there, take a look into the water and the remains of the ships that lie yonder. Your target is the chunk with the mast; you can see pretty clearly from the beach. Swim over there, and clamber up onto the piece of deck. The game will notify you that you’re near the clue as you approach it. Use the clue to reveal the cultist – Sophos the Broker. Sophos the Broker Order of the Storm Cultist Location – Where to Find? The Order of the Storm Cultist by the name of Sophos the Broker is hiding in plain site in the Patrai Military Shipyard. That’s in the Mount Panachaikos region, in the northwest of Achaia. Your best bet is to simply fast travel to the Temple of Zeus synchronization point and just head north. Follow the Cultist icon until you come across Sophos. Keep in mind that he has pretty beefy security. Plus, shockingly tough civilians will also defend the wharf. So, be prepared for a good ole tussle. Don’t forget to confirm the kill. That’ll do it for the Shipwreck Cove cultist clue location, and where to find Sophos the Broker. If you need further help with the Shadow Heritage episode of the Legacy of the First Blade DLC, you can check out some of our other guides. Among others, we have Legacy of The First Blade Endings – Can You Avoid The Baby, How to Start Legacy of the First Blade DLC Episode 2, and Legacy of The First Blade Episode 2 New Weapons & Gear. Very good article! Thanks for the help! This article is of NO HELP AT ALL!!!! Which mast on which chunk of ship? Learn to write a helpful guide before you publish!!!!! You okay, buddy? The only mast that’s between the two large rocks. Just… look at the pictures. This is so not helpful. I have literally looked at every single piece with a mast in this cove and there is nothing.